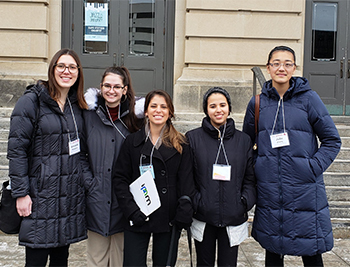 Four undergraduate participants of IPAM’s Research in Industrial Projects for Students (RIPS) Program presented their research at the 21st Annual Nebraska Conference for Undergraduate Women in Mathematics (NCUWM), held January 25 – 27, 2019, in Lincoln, Nebraska. The conference is a program for undergraduate women to connect with other women of all professional levels in the mathematical sciences, and “to arm participants with knowledge, self-confidence and a network of peers to help them become successful mathematicians” (NCUWM Website). The 2018 RIPS women who presented at the conference included Amanda McAdams representing the Lawrence Livermore National Laboratory team, Giulia Pintea representing the UNC Lineberger Comprehensive Cancer Center team, Fatima Zaidouni representing the Google LA team, and Julie Zhang representing the Aerospace Corporation team. IPAM would like to give a big thanks to Claudia Falcon, RIPS academic mentor and UCLA postdoc, who represented IPAM at the conference and supported the 2018 RIPS women in attendance.